When we think of non-profits most of us think of organizations like the Red Cross, Save the Children or Meals on Wheels. Their status as a non-profit isn’t solely based on the intricacies of our tax system, but the result of the positive work they do in American communities and around the world. However, some organizations have used their status as a non-profit to procure not only favorable tax standing but to also secure massive profits for executives and board members of the organization. Many non-profits do very little to benefit their respective causes while using raised funds for unscrupulous purposes. In light of this, here are some charities that aren’t quite so charitable after all. One of the most unique cases on our list is the American Association of State Troopers. According to the organization’s mission’s statement: “the American Association of State Troopers was formed to provide benefits for trooper members as well as their families.” From 2004 to 2011, the organization raised nearly 45 million and spent less than four million on member benefits. In addition, the non-profit has been fined five times by regulators and paid out $300,000 in fines. Sadly, this is just one more reason for potential donors to be careful before opening their pockets for a worthwhile cause. Cancer awareness and the fight to combat the disease has taken a national spotlight as more and more organizations have worked to raise funds and resources to find a cure. The Cancer Fund of America alleges to do just that in its letter. The organization claims to be on the “front lines of the fight against cancer.” However, Cancer Fund of America does not spend a dime to fund research or pay for the cancer treatment of victims and their families that are struggling to survive. The organization instead collects donated goods including: shampoo, DVDs, and air fresheners which they ship to dying patients and their families who have lost everything in their attempt to pay for necessary treatment. According to IRS records, over the last decade fundraisers have collected over $98 million in donations while patients have gotten less than $1 million in direct cash aid. Other documents show that Cancer Fund of America’s founder, and at least a dozen other family members, earn a total of $1 million in salaries from the organization. One of the worst charities on our list is the Children’s Wish Foundational International. The mission of the organization is to “bring magic, joy and hope to seriously ill children and their families around the world.” However, the non-profit has been gotten in serious hot water five times in four different states: Connecticut, Georgia, Maine, and Pennsylvania. Founded by Linda Dozoretz, Children’s Wish spends only about 10% of its funds helping fulfill the wishes of dying children. They have paid out $61.2 million to its solicitors while Dozroetz takes home an annual salary of more than $250,000. Children’s Wish Foundation International is one of several charities that mimic the name and the mission of the well-established Make-A-Wish Foundation in Arizona. One of the most compelling cases of the rampant corruption in the non-profit sector goes to the Breast Cancer Relief Foundation. According to reports, its founder, Donald G. Tarver, had already been accused of diverting too high a percentage of funds to a for profit solicitor at a previous non-profit organization. Nothing would change when he formed his new charity Breast Cancer Relief Foundation. According to the IRS, it has been one of the nation’s most wasteful charities. While raising more than 64 million dollars, Tarver has allowed private companies to keep upwards of 70% of donations. Victims of breast cancer receive just over 2% of the total funds raised. If you get a call from someone from the Firefighters Charitable Foundation, do yourself a favor and hang up the phone. The organization has a notorious group of solicitors that have been tremendously successful, raising 64 million dollars in just a nine year span. And while the organization claims to have been created to provide financial assistance to people who have been affected by a fire or disaster; less than 10 cents of every dollar goes to victims of disaster. Like so many others on our list, the organization pays its for profit solicitors the lion share accounting for 90% of total funds. It got so bad that the organization’s president Louis Pelico resigned citing difficulty reducing fundraising costs. The organization has paid more than 53 million to solicitors. 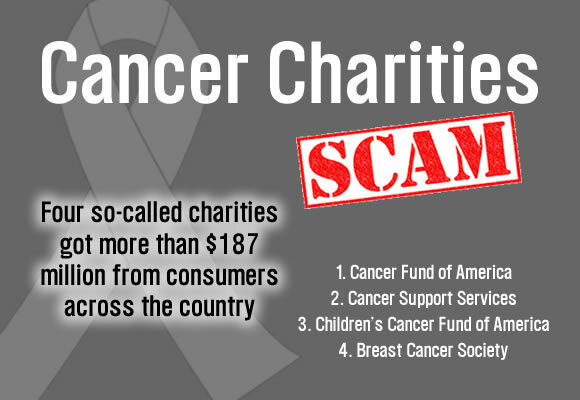 With a name that combines our collective sympathies for children and cancer victims, it is not hard to see how the Children’s Cancer Fund of America has done so well in misleading donors. Not surprisingly, the Children’s Cancer Fund of America is run by an associate of Cancer Fund of America. Rose Perkins, the founder of the charity, was married twice to James T. Reynolds – the man who transformed the Cancer Fund of America and initiated the large payments to executives and family members. Records show that since the organization’s inception it “has raised nearly $38 million and let professional fundraisers keep nearly 78 percent.” Cancer victims have only received around $300,000 per year. Keeping up the family tradition of exorbitant salaries, Perkins pays herself more than $200,000 while her organization pays out less than a nickel for every dollar earned. One of the most eyebrow raising organizations on our list is Project Cure. Its ability to exist as a non-profit is troubling as its office is nothing more than a storage unit. Located in Tampa, the small office is filled with nothing but plastic bins and unused furniture. Despite this, the organization has managed to raise nearly $65 million since 1998 to lobby Congress and educate the public about alternative treatments for major diseases like diabetes, cancer, and Alzheimer’s. The organization’s purpose is supposed to be educational and yet its efforts consist of websites that do not even contain original content. Michael S. Evers, Project Cure’s president, is paid about $200,000 per year with nearly 90% of all donations going to fundraising fees and expenses – it doesn’t take a genius to see how the non-profit is in debt. The story of Woman to Woman Breast Cancer Foundation is one of the best in demonstrating the inner workings of corrupt non-profits. What might have started as a genuine attempt to help promote breast cancer awareness turned into a money-making operation when Jacqueline Gray and her family agreed to pay 90% of its funds to a telemarketing business. After struggling for a year to raise money, the Grays met with a consultant who introduced them to said telemarketing firm, which agreed to give the Gray’s thirty thousand dollars in seed money. In return, the company would take the lion’s share of the donations. Woman to Woman raised $14.5 million in donations from 2009 to 2011 while during that time, they only paid out $20,000 dollars annually to provide for mammograms and other services. The Grays have also taken a salary and own cars purchased by the organization. Another soft spot for many Americans is the treatment of our troops when they return from war. The National Veterans Service Fund has capitalized on this by reinforcing the idea that the “war does not end on the battlefield.” The organization states that its mission is to educate and inform the public about the needs for veterans and their families. They also claim to help in providing limited assistance, relief and referrals to appropriate agencies. In reality, the organization does very little to help veterans with more than 80% of funds going to solicitors. The organization is another example of the use of veterans as a ploy to fulfill another agenda that has little to do with improving the lives of these men and women. The most secretly corrupt charity on our list goes to the Kids Wish Network. While the organization sounds like the Make-a-Wish Foundation, the Kids Wish Network has a very different agenda. Every year, the non-profit raises millions of dollars in donations in the name of dying children and their families. However, Kids Wish Network spends less than three cents on the dollar helping kids. Let that sink in: less than three cents on the dollar. Instead of helping children, the Kids Wish Network funnels the money to the charity’s operators and the for-profit companies it uses to garner its treasure trove of donations. What makes this case so tragic is the vast amount of funds at its disposal: “in the past decade alone, Kids Wish has channeled nearly $110 million donated for sick children to its corporate solicitors.” That figure is not even including the $4.8 million that has gone to pay the charity’s founder and his own consulting firms. Catholic Church not on this list? Otherwise known as the Pedo Protection Group. My mom is going to form her own charity soon since she just sold most of her business. Ill make sure to roundhouse kick her if she doesn’t give as much of the donations she can to the charity. The NFL Also claims to be a non profit org. Can you believe that crap?? Actually, the NFL dropped its status as a non profit in 2014 or sometime around that. Dara, what does the Catholic Church do that is so terrible? Up would like to know. I know the Girl Scouts are not secretly corrupt, but that Girl Scout cookie racket of $4 a box for about half the cookies of comparable Keebler’s brands is quite a scam on its own. When we think of non-profits [comma] most of us think of organizations like the Red Cross, Save the Children or Meals on Wheels. Why is the Clinton Global Initiative and Bono’s Charities not on this list, they are worse than all of these combined.. There was a 1 page post of about 6 good charities across the top. And another row of the worst. Simple a bunch of small paragraphs to refer to. However, for organizations, organization corruption is the unethical and/or illegal allocation of organization resources and/or opportunities. Most non-profits actively engage in corruption because the membership at large have little to no actual representation. Corrupt board members are self serving and stifle organization growth. See he Veterans Administration, American board of Podiatric surgeons, and all major hospitals. Clearly administrative mafia undermine the mission of these organizations. The top charities in America are *all* corrupt. Check out how much their executives make and how much they actually spend on charity work. If the ACS was a building, they would have been condemned by now. 50 years and 100 billion dollars on cancer research and – nothing , zero, bubkis. Not a penny for these crooks.